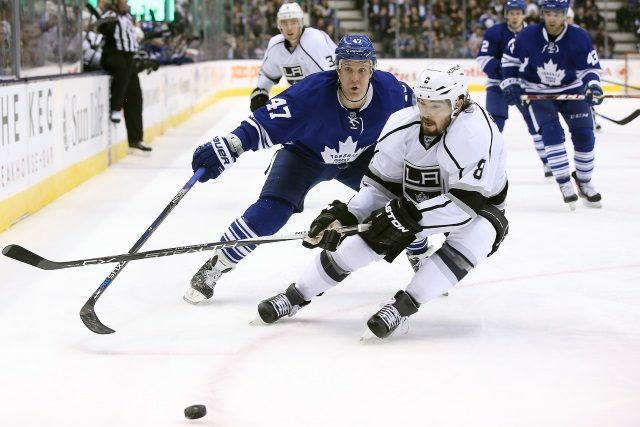 Will the Toronto Maple Leafs make a trade for Drew Doughty? Could the Leafs trade William Nylander and Jake Gardiner for Drew Doughty? Toronto Sun: Steve Simmons reports if you’re the Los Angeles Kings, and you’re slow and you’re lacking offence and youth and you desperately need change, aren’t you camping out and trying to work a deal for William Nylander? And maybe Jake Gardiner? Crazy as it sounds, and I’ve never been one of these talk-radio trade proposal guys, if I’m Kyle Dubas, I’m going to inquire about getting Drew Doughty to waive his no-trade clause and see if you get him in some kind of sign and trade for Nylander and Gardiner. Simmons states the LA Kings would get all kinds of speed and talent from the Leafs. Toronto would get that No. 1 defenceman the world has been screaming for since Borje Salming was young about a million years ago. Will the Edmonton Oilers trade Zack Kassian? Edmonton Journal: The Edmonton Oilers have given Zack Kassian “permission to seek a trade out of the city to try to find a fresh start. Kassian was last a consistent, impact player in the 2016-17 Stanley Cup Playoffs. That is what earned him his current 3-year, $5.8m contract. But so far this season, Kassian is point-less and -4. He has been a healthy scratch in 3 of the club’s 9 games. Teams like the Carolina Hurricanes, Florida Panthers and even Tampa Bay Lightning could use some toughness. But so far GM Peter Chiarelli has not found a taker. If the Oilers continue to find no takers, do you place the guy on waivers and hope he gets claimed for the $2m in cap space? Maybe.